A: Get the subway (MRT) to Latprao (sometimes spelled Latphrao or Latprao) station. B: You can get the BTS skytrain to the Morchit terminal station, then transfer to the subway (MRT) at Morchit and get off at Latprao station (2 stops). ** Come out of the Latprao subway (MRT) using exit 3 that leads to Latprao Road, turn right, walk along about 50 metres (you will pass a pedestrian road bridge), turn right again into Soi 15. * Walk straight down past the first intersection (keeping the corner spirit house on your left) and the House of Dhamma is on your right just after that intersection. 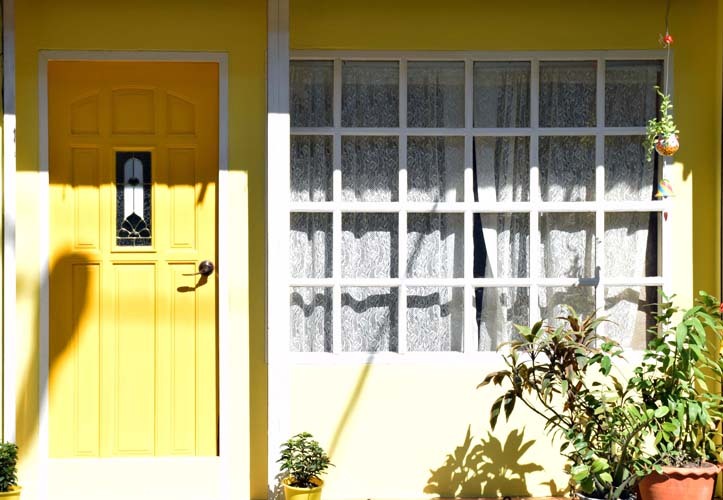 It is a yellow-painted shophouse with a big House of Dhamma sign across the front of the House. The house number is 26/9. It is about 5 minutes walk from the main Latprao Road. Note: please do not take the left fork at the first intersection in Latprao Soi 15. If you do, you will end up going to a different part of Soi 15. There is a spirit house/shrine at that first intersection. Don't take the left fork or the little right turning there. Just go straight ahead. Ahead of you, there's a corner building (that has just been renovated), then a rice shop, then a dressmakers, a lawyer's office and another food shop. 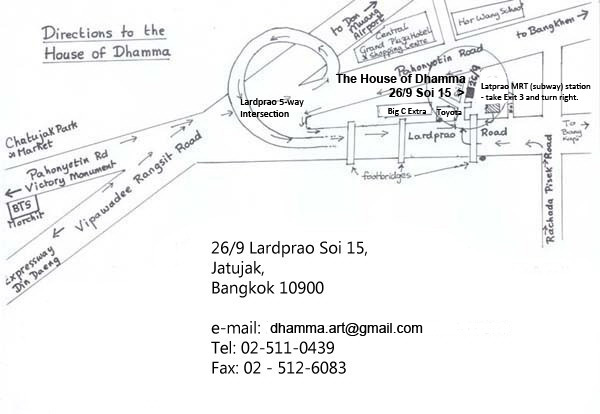 The next shophouse is the House of Dhamma. It’s about 10 minutes walk from the station. Note: The doorbell is high up to the left of the door. Please ring and wait because someone will be coming down from the third or fourth floor to open the door. C: Another option is to get a taxi from Morchit BTS station and tell the driver "Latprao Soi 15". The fare will be about 80 baht. As you come along Latprao Road, you will pass Big C supermarket on your left and there is a big Toyota showroom at the corner of Soi 15. You will need to tell the driver not to take the first left fork in Latprao Soi 15.